I will make this OpenRules project publicly available soon so everybody would be able to download, modify, and execute this decision model. Meanwhile, I will describe this executable version of Nick’s model with some comments. The main decision invokes two sub-decisions that should “know” their own business logic. Click on the picture to see a larger image. Along with a very similar decision table you will see something called “Boxed Expression” and other “boxed” DMN concepts that Nick really “hates”. As a business analyst, he has serious reasons for that, and we, at OpenRules, are trying to avoid the necessity to use these technical and awkward constructs. 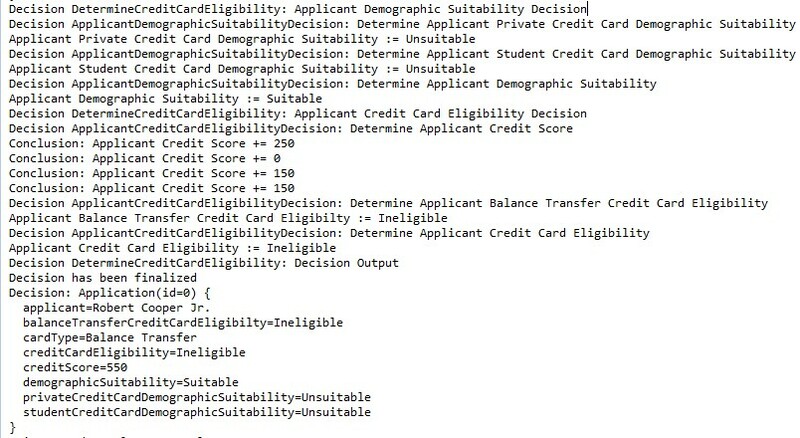 Still Nick (probably) made a mistake in his decision table by calling variables like “Applicant Private Credit Card Demographic Suitability” instead of the proper decision table. OpenRules offers several other ways to represent these relationships between decision tables, and a user may choose the most appropriate one for his/her particular decision model. There is another big topic to discuss called “Hit Policy” but I will get back to it at the end of this post when I complete the description of the implementation. We do not use a special first column with a mystical characters “NC” and unnecessary numbered rules; instead our decision table is simply defined by the keyword “DecisionTableMultiHit” in the top-left corner. 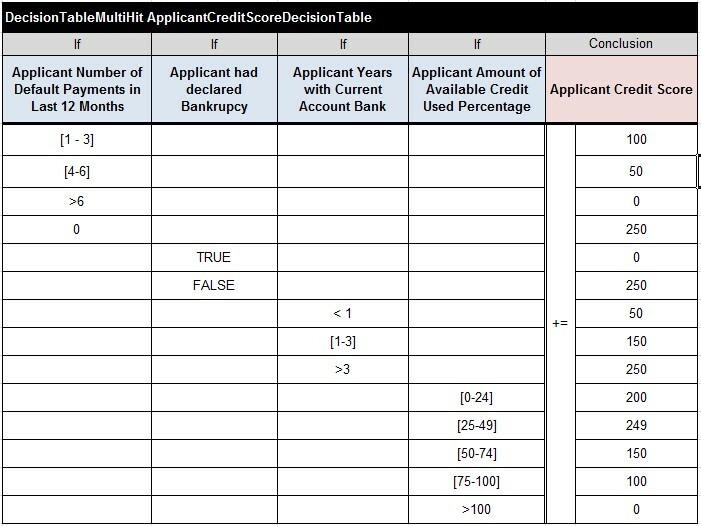 We do not use a special last row with “Aggregation = sum” that brings many questions to be addressed: does it belong to only action-column “Applicant Credit Score”? what if we want to use different aggregations inside the same column or even different action-columns? 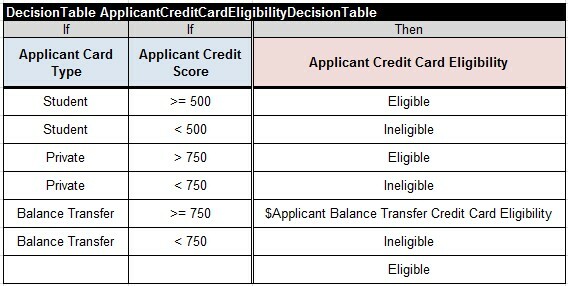 At the same time OpenRules’s aggregation is simply a special type of the standard operator “+=” in the action-column “Applicant Credit Score”. As this example uses the same increment-operator “+=” for all rows, we simply merged all operator rows. 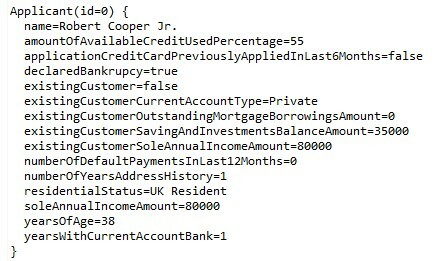 But a user may also use “-=”, “*=”, and “/=” in different rows of the last action “Applicant Credit Score”. This completes our business logic representation. 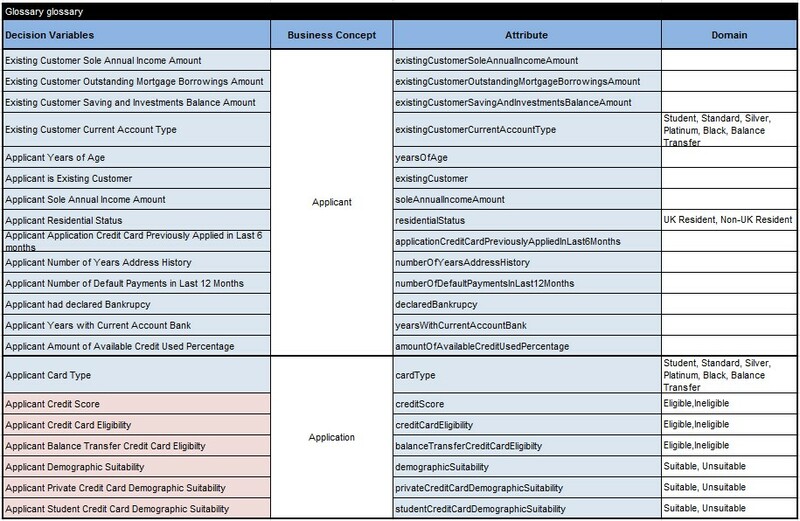 I decided that for this simplified version it will be enough to define only two business concepts “Applicant” and “Application” (see the second column above). Then I filled out the first column by copy-pasting all decision variables from the column titles of all previous decision tables. 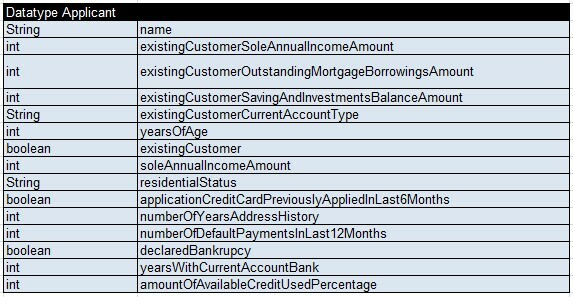 The third column contain “technical” names of the proper object attributes for the mapping to the actual data (no spaces allowed). And finally the fourth column (optional) defines possible domains for some variables. Decision modeling should be test-driven. So, to execute and test out decision model we need to create at least several test (use) cases that become an essential component of our decision model. It should be done even before you commit to any decision execution platform (while I personally do not like such separation). Now we are ready to execute our decision model against thee 3 test cases. I quickly modified a standard Java template that execute the most of OpenRules-based decision model. It you are interested you may find the actual code here. If you look at my decision tables and those proposed by Nick, they are very similar with only a few differences. However, there is one important difference in our interpretation of the DMN that I want to clarify now. The second character ‘C’ is supposed to tell if the decision table is complete meaning all rules are included to cover all possible combinations of decision variables. I don’t think that a designer of the decision table should decide whether the table is complete or not – it should be done by an automatic tool. For example, this table obviously is not complete even if we mark it as “UC”. 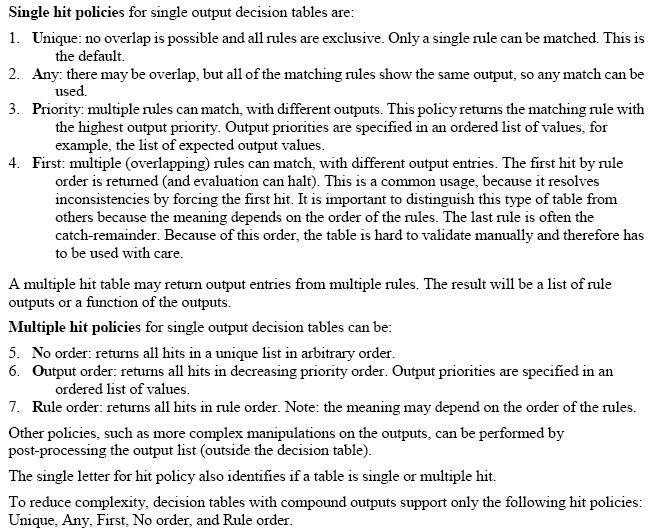 OpenRules provides one of the most sophisticated decision tables mechanism with different hit policies but we use a much clearer way to define it. I’ve already sent my critique to the DMN developers and together with other BR vendors we plan to send more specific suggestions to them. I hope they will find the example produced by Nick and my implementation useful while considering modifications to the beta version of the DMN.